Polish Bługowo (pronounce Bwoogovo w as in word, g as in group) is a small village located in north part of Greater Poland. 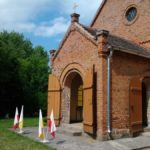 Driving along its main road apart from picturesque landscapes and then after the old Cross of Christ and several both old and modern houses you will see an old fashioned green metal fence with a gate in the middle of it and concrete stairs in a front of the entrance. Don’t be discouraged by this wire fencing just pass it if a gate is open, because a building you would see is a pearl of architecture definitely. 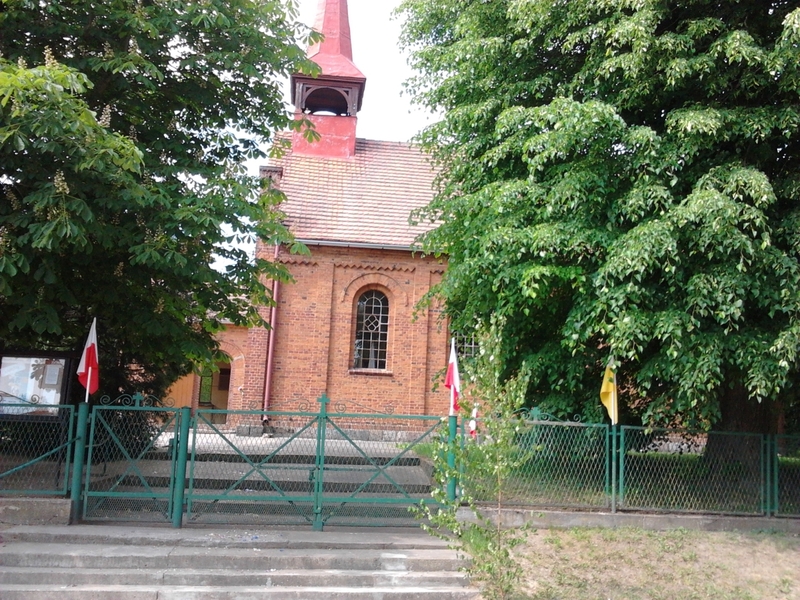 The old red brick church is more visible from the road since autumn until early spring, while in late spring and during the summer is a little hidden by widely spreading trees in a front. The church in late spring visible behind the wire fencing. Saint James Apostle’s (son of Zebeedee) the church is also located (exactly 53°15′ N 17°07′ E) very close to the cross-shaped Sławianowskie lake (pronounce Swavianovskie w as in word, i as in big). Moreover, the lake is also called Wielkie (pronounce Vielkie) – what means a great one, as it’s one of the biggest in this part of Poland. Briefly the location is indeed attractive for visitors. 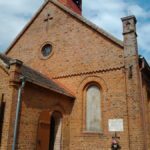 The church in its current form was built in 1864-1869 A.D in Neo-Romanesque style. In 1953 both the interior was redecorated substantially and electricity was installed. 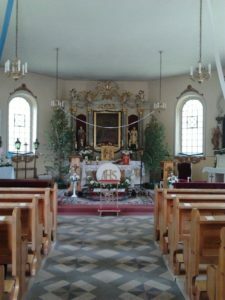 Then in 2000 the whole interior was refreshed and renovated. Although the building was raised in 19th century, in chronicles, one can find mention even from 1349 suggesting that a parish and also from 1445 that a church were present in the village. 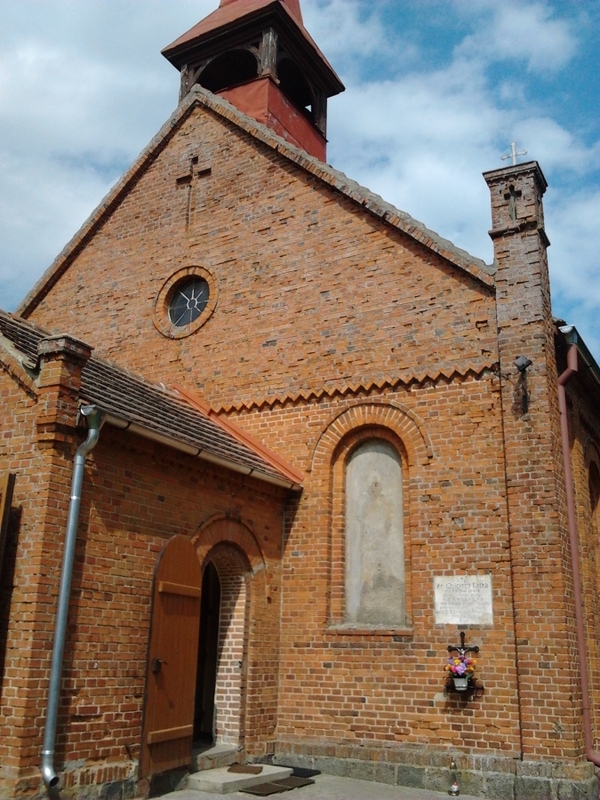 The church is a parish for two villages Bługowo and Kunowo (pronounce Koonovo). I have had a chance to be in the described place many times but the one on 26th May 2016 was actually a special one for me. 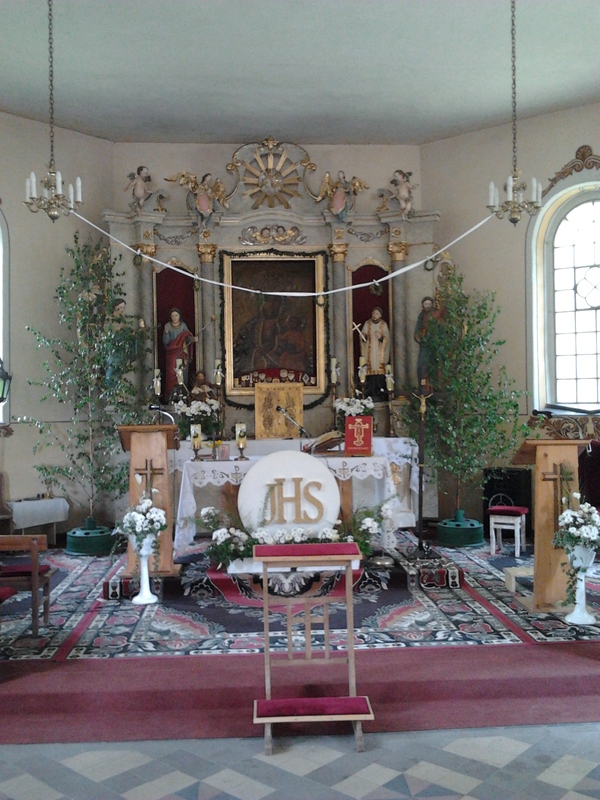 There had been a special Holy Mass and after it we went outside, then through the village, decorated with religious symbols and small birches, we attended religious procession. Such processions take place every year on Thursday – exactly 60 days after Easter all over the Poland. Corpus Christi, day, as it’s called, has strong catholic tradition in this country thus is a bank holiday. 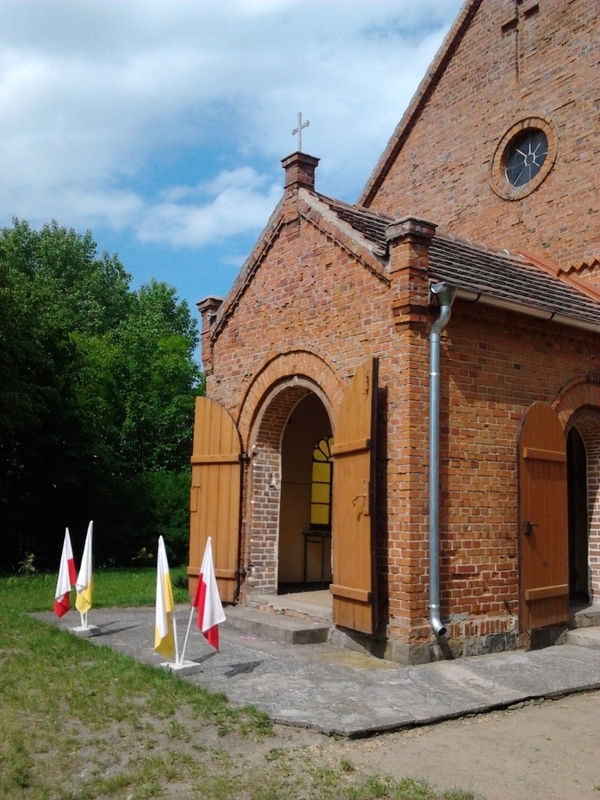 I encourage you to visit Bługowo, the church and surrounding area any time, however especially on Corpus Christi day, to feel the taste of Polish village. Surely, that experience would be unique and to remember. A view on the main altar of the church. A main entrance of the church. 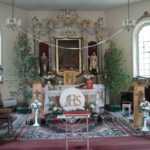 This entry was posted in Travelling and tagged bługowo, church, corpus christi, kunowo, poland, saint james, sławianowskie, village on October 13, 2016 by admin.